A 7-Eleven clerk in San Diego was more confused than frightened on Monday when a would-be criminal dressed as Gumby entered the store and—apparently concerned that his purpose there wasn’t obvious—informed the clerk that the store was being robbed. From that point, things didn’t proceed quite according to plan: As one report tells it, the robber began “fumbling inside the costume as if to pull a gun,” but found the get-up too unwieldy for the purpose. Instead of producing a weapon, the robber ended up dropping 27 cents on the ground and fleeing the scene in a white minivan. (Wonderful, wonderful video footage here.) 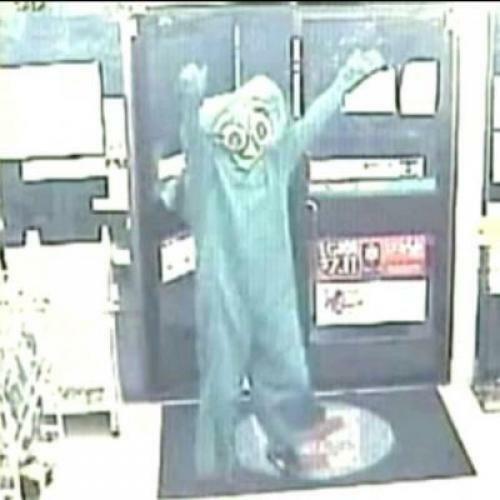 Criminologists probably didn’t need real-world evidence to determine that adult-size Gumby suits are less than ideal for robberies, but the failed attempt does invite the question: Does this tactic stand out in the world of crime? To be sure, this was an extreme case, but criminologists who track the behavior of armed robbers report that disguises are common. In fact, one major Australian study found that disguises are one of the most common “planned” elements in armed robberies—in one survey, nearly 80 percent of armed robbers who targeted banks wore some kind of disguise. That’s more than the number who bothered to enter their target on a prior occasion and look around, review the target’s security, locate the nearest police station, or find out how much money the target had. And while the study found a stocking over the head to be the most common disguise, the head is not the only part of the body robbers may attempt to conceal. Another study from the UK described how investigators identify criminals by analyzing their posture and gait from security footage. One robber, the report notes, was bow-legged, and “even though the individual wore two pairs of trousers […] he could not disguise the way he walked.” Maybe when the San Diego police have assembled a group of suspects, they could take some guidance from this example and see how each one fares in a full-body Gumby costume.